Vibraphone players are something of a rare breed in jazz music, sometimes a happy accident, Mark Sherman being one of them. Serendipity is known to take its time, so perhaps it is no surprise that Sherman, 51, was well into middle age before he really hit his stride. Named the “Rising Star” among vibraphonists for the past two years in the Downbeat magazine critics poll, Sherman is quickly catching attention for his muscular and deeply melodic style. 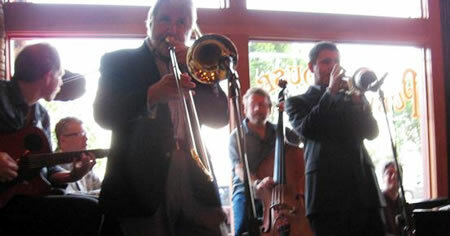 Sherman’s quartet — he is playing with a local rhythm section — plays tonight and Saturday at Tula’s jazz club in Belltown. 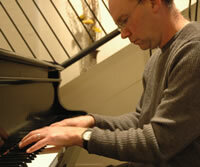 Joining Sherman is pianist John Hansen, bassist Paul Gabrielson and drummer Jose [Martinez]. Sherman, a member of the music faculty at New Jersey City University, will also teach an open clinic Saturday afternoon at Tula’s from 3 to 5 p.m. with drummer Greg Williamson and singer Karen Shivers. Wayne Horvitz and Sweeter Than The Day kick off a west coast tour tonight at Tula’s Jazz Club. Formed in 1999, Sweeter Than the Day began simply as the acoustic incarnation of Zony Mash, and Wayne Horvitz’s first piano-based ensemble in over 10 years. Despite the shared personnel, the ensemble is quite distinct from the electric Zony Mash and the repertoire is almost entirely different. The band has toured throughout the US, Canada and Europe, and will be headed down the west coast at the end of January. Sweeter Than the Day recorded 2 CDs for the Songlines label: American Bandstand (now re-titled Forever) (2000) and Sweeter Than the Day (2002), in addition to a live double CD on the Kufala label, entitled Live at the Rendezvous (2004). Their latest record, A Walk in the Dark, was self-released spring 2008. … a great showcase for Horvitz’s beautiful compositions, his really strange angular chord progressions. International trombonist Jiggs Whigham leads an all-star bi-coastal jam session on Jazz Northwest on 88-5 KPLU on Sunday, February 1, 2009. Joining Jiggs are Gilbert Castellanos, Bruce Forman, Gary Versace, Chuck Deardorf and Matt Wilson, recorded at The Public House during last Summer’s Jazz Port Townsend. Pull up a chair and join us for a Sunday afternoon jam at 1 on Jazz Northwest from 88-5, KPLU. Over the coming weeks we are going to run a series of posts relating to the value of live music, jazz, culture and the importance of what we as musicians do and how it effects others. Throughout all of history with wars and economic downturns, as well as men landing on the moon and people dancing in the streets, music has been there in one fashion or another. No matter what we or our ancestors have been through, we have always had a sound track. Musicians have always been around to shoot us to the heavens, funk us to the low down, swing us into delirium and soothe our wounded hearts. Musicians are the constant of history, and music is the one sure thing … So I propose that we make this the Year of Live Music. I’m standing on my chair (OK, home alone at my desk….You can’t see me, but still…conjure up an image.) and asking you to commit to going out and supporting live music, whenever or wherever you can. Well, here it is the New Year again. It seems I should have some inspiring personal missive or perhaps a bold, optimistic profundity to share. But the truth is people: I got nothing. Oh sure, I’m plenty excited for the January 20th inauguration. Even though the election was back in November, I still grapple to find the words to express how it feels to be alive during such an unprecedented moment in history. Trust me, it’s big stuff for me….for all of us. However in regards to 2009 overall, I don’t have much commentary, personal, political or otherwise. But I’m here and you’re here, so I feel like I should come up with something. So, I am going to make a short but heartfelt plea to encourage you to make 2009 the Year of Live Music in our community. Yes, times are hard, and there’s plenty to be gloomy about, especially on the economic front. This is precisely why, however, that we need live music. Music is a living, breathing, burning entity. It is bigger than the cosmos but affects us on a cellular level. It is the tried and true magic that lifts us up and energizes us. It is the enduring comfort that reaches down to our most desolate places. It is everything in between. Throughout all of history with wars and economic downturns, as well as men landing on the moon and people dancing in the streets, music has been there in one fashion or another. No matter what we or our ancestors have been through, we have always had a sound track. Musicians have always been around to shoot us to the heavens, funk us to the low down, swing us into delirium and soothe our wounded hearts. Musicians are the constant of history, and music is the one sure thing. So I propose that we make this the Year of Live Music. I’m standing on my chair (OK, home alone at my desk….You can’t see me, but still…conjure up an image.) and asking you to commit to going out and supporting live music, whenever or wherever you can. Drop into shows. Support restaurants and cafes that have live music. Better yet, ask your local noodle shack or pizza joint to start booking bands and musicians. If you’re a musician, go out and hear your friends play. If you’re driving home from work, drop into your neighborhood coffee shop and throw a buck or two into the hat of the guy playing acoustic guitar. If you’re low on cash, there are plenty of places to catch music for free. If you have some bread, then squirrel a few bucks away to spend on a cover charge or two. 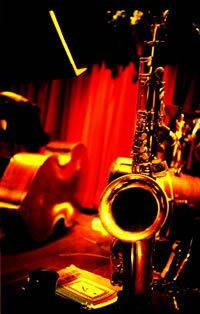 Think of this, for one month of basic cable, you could catch two or three really great live jazz performances. Make music part of your New Year’s resolution effort and reward yourself for putting down that donut with two or three (or five or ten or nineteen) nights a month out listening to music. Take your friends. Invite your mom. Get up your nerve and finally ask that special someone out on a date. Ride your bike. Hop on a bus. Saddle up a donkey. Carpool with your neighbors. Just go out and listen to live music! It’s not just about keeping musicians working, although that’s very important. It’s about keeping our collective selves alive, engaged and energized. It’s about making the place we live hip and wonderful. 7pm – Mark Taylor/Jason Goessl – Tenor sax and guitar duo! About six months ago, Mack Waldron had the contract in his hand. Sign it and the club he had owned for 15 years, Tula’s, would belong to someone else. All he had to do was sign his name. His lease was ending. His rent was going up. He was 67. His knees and his feet ached (that was the gout and the arthritis). Still, he’d always told himself he could do any of the jobs in his club if he had to, the cooking, the cleaning, the serving. He decided to tear up the contract. And so Waldron continued for at least another three years what has become both his love and his burden. The static popularity of jazz, the economics of hosting live music, the current recession — all have taken their toll on places like Tula’s, and in particular, on the open jam, a timeless ritual of jazz. Starting in February, Tula’s will have only two open jams per month instead of one every week. Once upon a time, Tula’s hosted two a week. The stage in Benaroya Hall was an ocean, vast and endless, the 16-piece New Orleans Jazz Orchestra an island. To encourage intimacy and interaction among the musicians, the men faced one another in a shape that resembled a horseshoe, the way a choir might arrange itself. Early in Thursday night’s performance, the first of five through Sunday afternoon at Benaroya, trumpeter and bandleader Irvin Mayfield announced they were going to turn the symphony hall into their own little jazz club. “The first thing we’re going to do is put two bars on stage,” he joked. The booze never materialized, but the effect he promised did. It was no easy feat in the cavernous hall. But the group overcame the room’s scale by playing with oversized emotion, one that shifted frequently from joy to anguish and all the subtle attitudes in between — sarcasm, surprise, solemnity and wistfulness. The NOJO is a real, New Orleans band, with real New Orleans musicians and all that comes with that musical breeding: an innate connection to the blues and to the Christian church; a love of the beat; engagement of the audience; and true respect for the notion that the music is just an extension for how you live. You cry, you laugh, you dance, you mourn. That is life and that is the music. Without taking an intermission, the band moved through seven songs, all of them fiercely traditional, in that they were firmly rooted in the blues, or gospel, or Cuban son. Strong, disciplined arrangements allowed individual musicians to solo, seemingly without tether. It made for moments of beautiful chaos, which also helped to transport the audience a bit from the austere setting of the symphony hall. 11pm – Hejira – Don Baragiano and George Sadak (dumbek player extraordinaire) will be performing as Hejira & bringing their original brand of World Music Alchemy to Egans. Katrina and the “Skin Deep Dance Troupe” will be performing with us & Cosmo Damian will be on 6 string bass. We’re coming to shake you guys up! The insinuating rhythms and alluring melodies of Brazil have seduced many a jazz musician, but few have fallen as deeply as vocalist Sandy Cressman. Born in the Bronx but raised from childhood in the San Francisco Bay Area, she spent years working as a jazz singer before fully succumbing to the ravishing charms of musica popular brasileira, or MPB. These days Cressman’s repertoire features a treasure trove of tunes by Brazil’s best contemporary composers, from Milton Nascimento and Djavan to Gilberto Gil and Ivan Lins. “Sandy has really studied Brazilian music and created something unique, a sound that’s not like other Brazilian singers or American singers,” said the Seattle-based pianist and composer Jovino Santos Neto, who accompanies Cressman at Bake’s Place on Saturday with bassist Chuck Deardorf and drummer Jeff Busch. Pianist Bill Anschell is joined by Chuck Deardorf and Dean Hodges, the storied team that was Jazz Alley’s house rhythm section for many years; together, they backed some of the world’s greatest touring jazz pianists and horn players. 7pm – Third Hemisphere w/ Cynthia Mullis (saxophones), Ben Verdier (piano), Dean Schmidt (bass) and Steve Korn (drums). Performing Brazilian, Afro-Cuban and North American jazz in a unique exploration of music from the Northern and Southern Hemispheres. 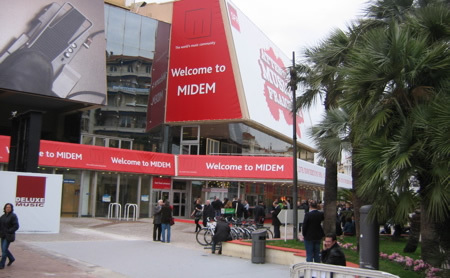 John Bishop and Matt Jorgensen just finished attending the 2009 MIDEM show in Cannes, France. The annual convention consists of over 9,000 music industry professionals gathering for meetings, showcases and lectures.